I woke up to this headline this morning: “Suspected Islamic extremist shoots dead at least 20 dead at Florida gay club.” These poor people had to wait for police to get there, police who have guns, to shoot this wicked man dead. My first thought? I bet this place was a gun free zone. My second thought? Liberalism kills. As I go around the town I live in I see this image all over the place, at golf course pro shops, our park district buildings, schools, stores. You know what I think when I see it? This is the stupidest message ever! What type of people are going to obey a message that they are not to take guns into a building? Yep, law abiding citizens who even if they had guns would never shoot another person. And what type of people are not going to obey such a message? Murderous thugs whose intention it is to kill other human beings, like the evil shooter at this night club. All such signs do is tell bad guys that innocent people in that building are defenseless. Modern liberalism makes me angry because in their smug, self-righteousness liberals think their intentions are all that count. 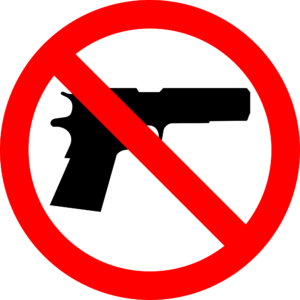 Gun free zones are a splendid idea, makes them feel all warm and fuzzy because if they declare a place should be gun free, then by golly there will not be any guns! And there will be no violence! They’ve decreed it! And I’m just waiting to see how long, and it won’t be long, before I read or hear one of those smug, self-righteous liberals declare that this sad event proves that we need more gun control. Yes, they’ll blame the NRA! You know what I’ll think when I read or hear that? Morons! But it’s worse than moronic. It’s criminal. Their utter lack of common sense gets people killed.